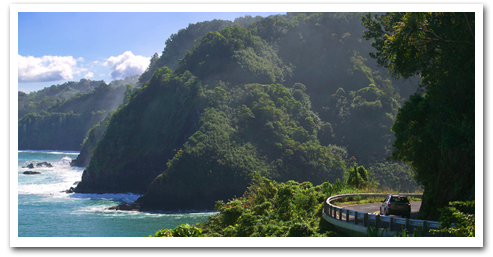 There is good reason this all-day excursion across East Maui is called a “heavenly” tour, with it weaving and winding to some of the island’s most divine destinations, including Keanae Lookout, Waianapanapa State Park, and the Seven Sacred Pools. “Heavenly” Hana Town – This “heavenly” town is home to Pii-lani Temple, the largest heiau in Hawaii, exotic flowers, rich history, a famous general store, and so much more. 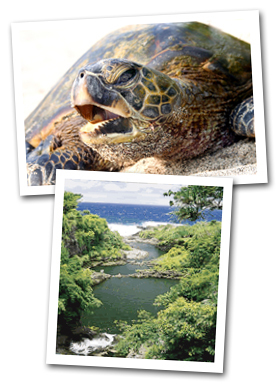 Palikea Stream – The largest perennial stream on Maui. Picnic Lunch includes a 6-inch sub sandwich, macaroni salad, fruits, cookie, canned juice and bottled water. Please inform us of special dietary requests 48 hours in advance. Menu is subject to change. The tour features a continental breakfast which includes freshly baked pastries, whole fruit, 100% Maui Grown Coffee, Hot Cocoa and a selection of Hot Teas. Moderate walking, please wear comfortable wallking shoes and dress appropriately. You may wish to bring a light jacket as it get cooler upcountry.